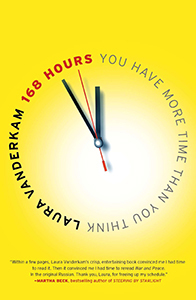 In Episode 56, I’m chatting with Laura Vanderkam about her book Off the Clock: Feel Less Busy While Getting More Done. 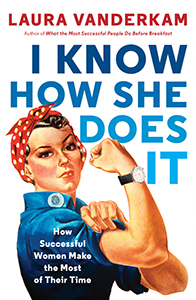 Laura is the best-selling author of several time management and productivity books including 168 Hours: You Have More Time Than You Think, I Know How She Does It: How Successful Women Make the Most of Their Time, and What the Most Successful People do Before Breakfast. Laura also co-hosts the Best of Both Worlds podcast with Sarah Hart-Unger. They discuss work/life balance, career development, parenting, time management, productivity, and making time for fun.Laura lives outside Philadelphia with her husband and four children, and blogs at LauraVanderkam.com. When I read Off the Clock in August, I shared my thoughts about it here. I am thrilled that I also had the opportunity to interview Laura for my podcast and ask her questions including her advice for how to overcome the hurdles I faced trying to track my time. We all have the same amount of time but spend it differently. How we think about time changes how we perceive it. When we walk around saying “I’m so busy”, are we? Which moments become your story? 900 people tracked their time and reported how they felt about it. What things are a good use of time? How to effectively track your time? Doesn’t have to be exact! Getting a general sense of where time goes. Data helps us see where our time goes. Looking at time in weeks versus days. Effortless fun is easy and ends up being the bulk of our leisure time. Effortful fun is more memorable. Putting in work to have fun.